Debuted his work in 1978 in the Shuukan Shonen Jump Magazine with a short comic called "Wonder Island"
Akira likes to draw manga at a more leisurely pace so that he can have time for himself and his family. Besides drawing mangas he also was character designer for several video games for Super Famicom (Super Nintendo) and Sony Playstation. Widely known all over the world for his playful, innovative storytelling and humorous, distinctive art style, Dragon Ball creator 'Akira Toriyama' is also known in his native Japan as the creator of the widely popular 'Dr. Slump', his previous manga series about the adventures of a mad scientist and his android '"daughter". His hit series Dragon Ball ran from 1984 to 1995 in Shueisha's weekly Shonan Jump magazine. He is also known for his design work on the video games such as Dragon Warrior, Chrono Trigger and Tobal No. 1. He lives with his family in Tokyo, Japan. Akira Toriyama is considered a shy person. He prefers the rural country setting to the city. He also prefers warm weather to cold. The country is where he gets his settings for Dragonball. 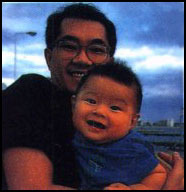 Toriyama in his free time enjoys spending time with his family, building models, and playing video games. He also likes pets including cats, dogs, and birds. Recently as of 1997 he has taken up taking care of tropical fish. After quitting Dragonball he currently works as a consultant for Dragonball GT, a series he had nothing to do with. The series was created by Bandai for younger audience. He has worked on several short stories such as "Alien X" and "Cowa". Currently Toriyama is working on a manga series called "Kajika". It doesn't look like Akira will stop drawing anytime soon.